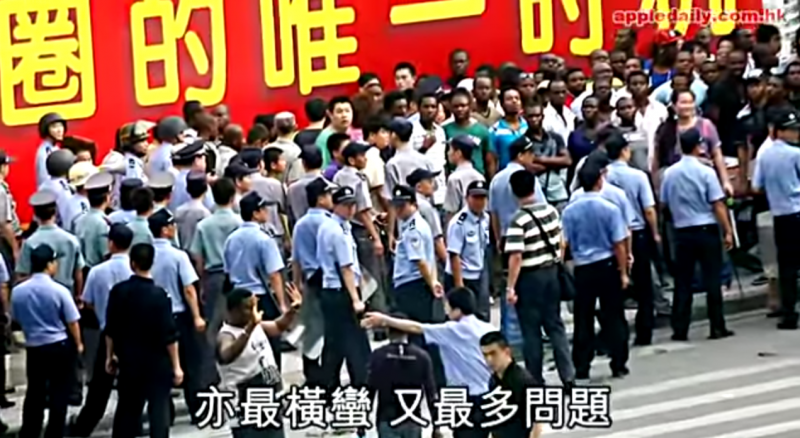 Screen capture of Apple Daily's video report from 2012 of Africans protesting in Guangzhou over the suspicious death of a Nigerian while in police detention. As racial injustice makes headline after headline around the world, with a particular emphasis on the American city of Baltimore, a dialogue has been opened on issues of race and xenophobia within mainstream media. And it’s not just within the US. Chinese Internet users have also posted countless racist remarks against people of African descent when commenting on the incident. China is experiencing a huge wave of African migration into major industrial areas such as Guangzhou, and as such tensions have arisen as Africans attempt to assimilate into Chinese society. 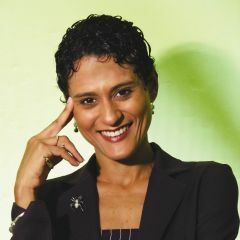 Gordon Mathews, an expert in the study of African diaspora in China, pointed out in a recent interview with a magazine that more and more Africans were married in China. He found in his research that about one-tenth of the Africans had Chinese wives or girlfriends and they on average give birth to 200 African-Chinese children every year in Guangzhou. One of the obstacles to African assimilation stems from China's strict control of the foreign population, which also indirectly helps the spread of racial stereotypes. In September 2013, new visa and residence permit regulations for foreigners took effect, which made it more difficult for individuals without corporate or institutional affiliations to work and do business in China than before. Once they overstayed without a valid visa, they would be subjected to a 500 yuan (approximately 80 US dollars) daily fine. According to a widely quoted media report in August 2014, the Guangzhou authorities have only issued about 30,000 resident permits to Africans, while there were around 300,000 undocumented Africans residing in the city, many of them in the trading business. In the Guangzhou case, 90 percent of Africans are undocumented because they failed to obtain a visa. They are frequently seen in the police station detention cells and hence the stereotype that Africans are associated with criminal activities is commonly shared among Chinese. Conversations about Chinese xenophobia and overt racism towards African immigrants have emerged, and despite the greater economic partnership between China and African countries, socially, there is still progress to be made. Foreigners bullying around in China reflects their weakness. China should not tolerate the existence of such evil forces. It's now high time for us to take action against the illegal black people residing [in China]. The above comment is liked by more than 1,670 users. Black Africans are a group of people that God has forsaken. Ebola, AIDS, etc. all originated from black Africans. Their genes are full of violence. They have sub-human body structure. Their brains are 400cc smaller than we Chinese. The explicit tone and underlying xenophobia displayed online is disturbing; the implication that such views speak for the entirety of the Chinese people is highly questionable. People tend to be much braver online where there's no fear of identification or retribution. Most people that spout racism online are generally people who've had no contact with black people or have been slighted by one and then hate all of them. Many will spew hate online to feel better about themselves but will genuinely be excited to meet a black person in real life. It would need the global image of Africans to improve first. The perception could change in places with many Africans but not elsewhere. It then becomes a question of time as to whether greater integration between the African communities within China will bring about a more positive perception of Africans and foreigners at large. If the economic partnership between China and Africa is to prosper within the coming years, then domestically social cohesion between the two groups is of the upmost importance. I lived in Guangdong for 15 years and frequently traveled to Guangzhou. My experience is that there are indeed many tens of thousands of black Africans doing small-time I/E business in Guangzhou. The very nature of their work means there can be long periods of relative inactivity, because they are visiting factories/distributors in search of products to ship back home, or they are waiting for new potential orders from buyers back in Africa. If they try to extend their visas during these periods of slow business, the Chinese authorities often tell them to go home first. Paradoxically, if they “go home” as instructed, they will not be on the ground in China to find exporters for their clients — thus they do whatever they can to avoid returning to Africa, including remaining without a new visa, working without a work permit, or even getting involved in petty crime. It is perfectly understandable that many GZ residents are unhappy about this situation. But it is also important for them to understand that this situation is exacerbated by the unfair practices of China’s immigration authorities. I am not saying the problem of African “overstays” in Guangzhou is entirely due to racist attitudes of the police and immigration authorities. But their racism is a major factor in denying many African businesspeople the more friendly treatment often given to “white” people from the West. The treatment of African businesspeople in China contrasts with the reception Chinese receive in Africa. Chinese can easily leave China with very little cash, arrive in Africa and set up a small trading business — and many are doing so. One reason they are succeeding: the African societies where they are doing business may or may not also be somewhat racist, but — as far as I understand it — they also don’t force those businesspeople to periodically return to China. They understand that for the typical small businessperson, that would be tantamount to making business unfeasible. Choose your friends carefully. ..Please remind your readers that there are two animals that sort and condemn their compatriots by color: HUMANS, AND CHICKENS. Being in a seemingly homogenous society in terms of race, Chinese people are insensitive to the negativity of racist comments. The list of types of discrimination goes on. Many people don’t realize that it is wrong to despise a person because of his place of origin, physical appearance or even gender. To them, the value of everybody being equal is not a part of their upbringing, unlike, especially, in the U.S. Same applies to being “politically correct” in one’s speech. Such differences, among many other reasons, make people careless about making prejudiced comments. 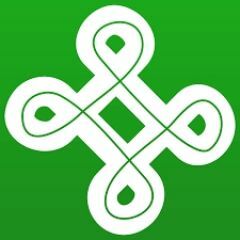 I think what would be helpful is for more people to learn about this community, e.g. their helplessness facing the dilemma between inflexible visa policies and the need to do business. The more people who can understand the perspective of being a person from Africa in China, the less prejudice there will be. Your article doesn’t make any sense. Racism does not exist in china. Racism is a byproduct of America. If anything, africans/black people are the ones who are racist by selectively attacking asians in both China and America. Are you… insane? Or just stupid? Speaking the truth doesn’t make me insane or stupid. I stand by what I said. What you said is crazy and untrue. If there is any truth to it it is very stilted and ignores many other facts. Which is a pity. there are many instances of blacks selectively targetting asians in china and america. A simple google search will yield thousands of examples. The reverse is not true as I have never heard of an instance of an asian selectively targetting blacks in africa or america. 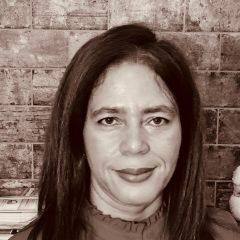 It is fairly obvious that the author of this article is biased as she portrays a one-sided view of the treatment of blacks while ignoring the plight of asians in the hands of blacks/africans. What do you mean “there are many instances of blacks selectively targeting asians in china and america?” What is this selective targeting you are speaking about? I got to this article from a Google alert, because I am interested in China-Africa issues. And, like you say, I did not think much of it because, yes, it is a “few isolated examples of online comments directed at blacks” by Chinese Weibo users (and maybe others). It is not methodologically rigorous enough for me to do anything beyond reading. So I agree with you on that. What I don’t buy is that “racism does not exist in china, nor any asian country.” No one with basic information would say that. I don’t even know whether you believe that statement yourself. The Chinese even discriminate against other Chinese who are not of Han descent; it is worse for Black people and other Asians. The Japanese are just as bad, as are the North Koreans. That is a basic fact. I am not really willing to listen, or even consider anyone who ignores what is so apparent just because they have issues against Black people. Firstly, dont be so judgemental. To claim that I have issues against Black people without knowing me is no different from my claim that you have issues against Asians. Secondly, what you described is an instance of colorism. This is very different from racism. Racism is “the belief that all members of each race possess characteristics or abilities specific to that race, so as to distinguish it as superior or inferior to another race.” Unlike America, there is no “belief” that asians are superior to Blacks or Whites. Blacks may be viewed unfavorably because of the color of their skin, but this is no different from the prejudice that dark Han Chinese experience by other chinese as well. 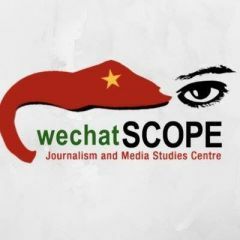 Unless you are claiming that chinese are racist against their own people (which would be both a contradiction and paradox), the argument of racism existing in china simply has no grounds. As I mentioned, racism is a byproduct and invention of America (and perhaps europe). China (or any other asian country for that matter) has never participated in racial cleansing, slavery, or ethnic oppression. Blacks (or any other race for that matter) are not randomly attacked on the street because of the color of their skin. If you disagree, then I dare you to list one country in this entire world (including african countries) where racism is less prevalent than china.